Home » Blogs » the national gadfly's blog » Al Qaeda Leadership Gather For Secret Meeting. "EFCA is The Great Satan!" addressing the crowd this morning. "We cannot allow ourselves to become complacent. George Bush is gone and nothing we can do will bring him back." 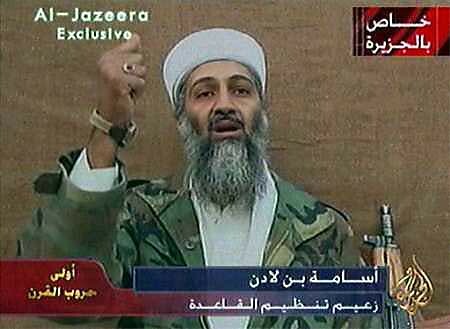 Mr. bin Laden warned the anxious attendees. "We cannot use the economy as an excuse. Our organization was built to create poverty and hoard wealth. We can still do that." union and to physically assault or kill any union organizers. file through improved education, health care and rights. the GOP, that these things could happen. outright as purely lies told by infidels. from poverty to disease on the Americans. made headlines by making similar statements. 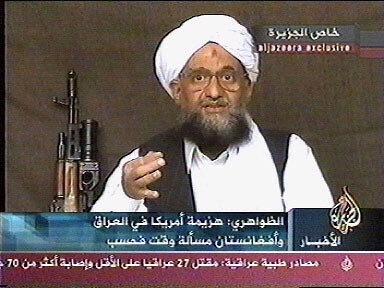 "EFCA is the Great Satan" Ayman al-Zawahiri tells reporters today. AQL have been in steady decline since the US Elections in November. tireless service to military colonialism and corporate greed. stated that he was ruthless greed, personified. world's largest exporters of jihad. a 'little somethin' - somethin' ' and a favorite mistresses back home. her father, her brothers...it never ends!" UBL probably showed up to collect on the deliverable he provided by reviving spending on weapons and domestic spying agencies. Now he'll have to take a bailout with a restrictions on bonuses. Little known fact: Muscat is the home of the original Muscatel wine. well played. nice tidbit on the Muscatel.